It doesn’t feel like fall should be right around the corner. Some of the days lately have been downright hot, but fall will officially be upon us in less than a month! You may also be thinking that it’s a little too early to start thinking about Halloween. Hear us out, though. Professional temporary lighting is a great way to decorate your home for Halloween this year and we like to have an idea of what we’re lighting about a month in advance. Planning your decorations early will really help you to get in the holiday spirit. Wondering what the benefits of having your temporary lighting professionally hung are? Read on! You don’t have to hang the lights yourself – Hanging temporary lighting can be dangerous, especially if you’re hanging them on your roof. You may not have ladders that are tall enough and there’s always some risk involved with standing on a tall ladder, even if you do have one. Our professionals have all of the equipment that they need as well as experience hanging lights in high places. One thing that tends to deter people from decorating around the holidays is the light hanging part. We can take care of it for you! Pay only for the lights that you need – One downside to purchasing holiday lights is that you only use them once per year, and there’s ALWAYS one that goes out when you try to plug them in the next year (and let’s face it, one goes out, they all go out). Instead of worrying about hunting down your lights, untangling them, and trying to make sure that all of them work, you can have your temporary lighting professionally hung and not have to deal with putting them away at the end of the season. Save time and get into the holiday spirit – Halloween can be a lot of fun. 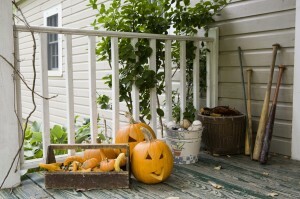 Kids love to see homes that are decorated for the season. Orange and purple lights are great for this time of year, but you probably won’t ever need them for anything else. Temporary colored lighting will help you to get into the holiday spirit without requiring you to waste hours of your life putting lights up on your home. Focus on the other decorations and let us take care of the lights! With a month advance notice, we can help you figured out the best way to add temporary lighting to your home for Halloween and take care of all the tough stuff. When you’re ready to get started, all you have to do is call Aqua-Bright today at 410-489-9009, stop in and visit us, or take a tour through our website to get started with your temporary lighting. This entry was posted on Thursday, August 28th, 2014	at 12:40 am	. You can follow any responses to this entry through the RSS 2.0	feed. Both comments and pings are currently closed.